The Montgomery County Schools recently accepted a grant from the Montgomery County Fund to support the school system's technology plan. 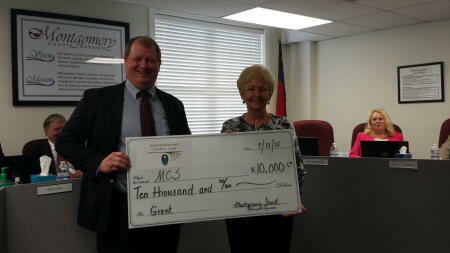 Dr. Dale Ellis, left, accepted the grant from MCF Board Member Kerry Hensley at a recent school board meeting. The MCF board of advisors earmarked $10,000 from its community grantmaking fund this year to be added to statewide grants received by the Montgomery County Schools to enhance technology for students. This grant was part of MCF's Blueprint for Success goal this year.